If you know of a member who is sick or in hospital, please let the Sunshine Committee know. Don’t assume someone else has advised them, it is better for them to hear about it two or three times than not at all. The Sunshine Coordinator is: Norma Andrews – When emailing please ensure that in the subject line of the message you put in the words ‘QBANA Sunshine’. Popular Hand and Foot version of Canasta organised into groups of 6 people at a time and hosted in members homes. This is a fun, relaxed evening. Instruction is available for new players. Sign up at the meetings as either a spare or a full time player. The mixed bridge currently does not have a coordinator. Create fun and festive Christmas Stockings! 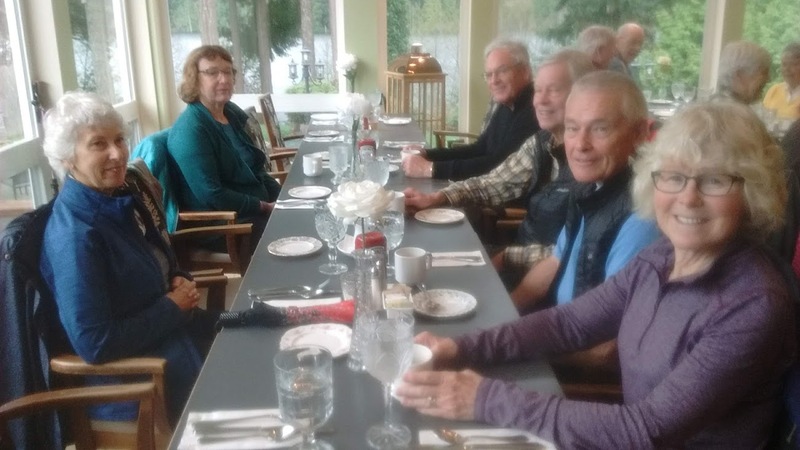 This is a fun group that dines at a different area restaurant the last Friday of each month. Each member takes a turn hosting the group for pre-dinner drinks and appetizers, choosing and booking the restaurant and then announcing the “surprise” dinner location sometime during the “Happy Hour”. Pre-dinner drinks are normally white and red wine and the appetizers are kept light. A fee of $2.50 pp is paid to the host to compensate them for the wine. Dinner with Friends is an enjoyable way to meet some new folks and keep in touch with others you don’t see as often. We meet 4 times a year at host member’s homes. The number of people for dinner is six to eight, including the hosts, depending upon what works for most hosts. The host provides the entrée and vegetables and the other attendees are asked to bring appetizers , salad or dessert. Guests are requested to provide their own beverage (e.g. wine) but tea and coffee are provided by the hosts. If you would like to participate in this enjoyable event and are not currently on our list, please contact either of the coordinators listed above. A sign-up sheet will also be available at all the monthly meetings. We play every second Thursday in groups of 6 to 8 players, from late September or early October to the end of April. This is a fun, relaxed evening. Instruction is available for new players. Sign up at the meetings as either a spare or a full time player. QBANA Men’s Golf plays every Monday at various courses, obtaining discounted green fees by using the BC Lung Book. Players of all skill levels are welcome. Our aim is to follow good course etiquette while having fun in a non-competitive atmosphere. Foursomes are mixed every week so that you will meet as many members as possible. QBANA men’s golf works solely by e-mail. We reserve a number of tee-times at the chosen course about a week prior to play. All QBANA Men’s Golf Members are then e-mailed with the location, the 1st Tee Time, and the cost. Members who wish to play reply by e-mail indicating any preferences (early / late tee time, if they are carpooling, etc. ); we do not require negative responses. On the Saturday or Sunday prior to Monday’s play, the week’s line-up is e-mailed to those members wishing to play. Thereafter, members desiring to make changes/cancel must do so directly with the golf course concerned. So, submit your e-mail address and come and join us – everybody welcome. Please volunteer the names of great speakers you have heard in the past, in perhaps another organization, or at a public presentation, etc. Often we have hidden gems among our membership so ladies don’t be afraid to tell us of your husband’s talents or vice versa. Contact us if you have any suggestions. The ladies, a.k.a. ‘Out to Lunch Bunch’ meet at 12:00 noon on the Wednesday of the week following the QBANA meeting (i.e. 8 days later). If you are not at the meetings to sign up but would like to go to one of the lunches, please contact either of the coordinators as listed above. Lunches are held each month on the Wednesday that falls eight days after the QBANA meeting. Those whose names are on our list will be e-mailed a few days before the lunch. Scotch appreciation provides an opportunity for scotch lovers to get together, sample various whiskies, and learn about the wide spectrum of scotches available from different regions of Scotland and the rest of the world. 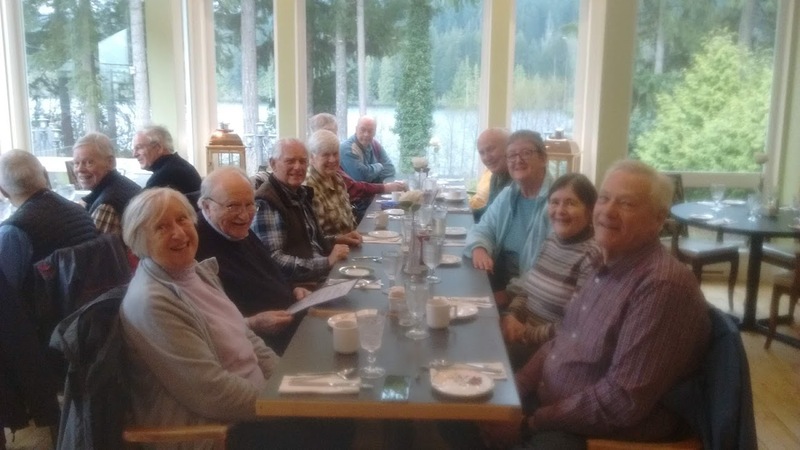 The group meets once a month and each member takes a turn as host. The host provides the whisky to be sampled and each member contributes to the pot to help defray the cost. We currently have 2 groups, Friends of the Quaich and The Gentle Glens. If you are interested in participating or need further information, call David or Ian. We’d love to hear from you. Activities are advertised at the Singles’ table at the QBANA meetings. Note: Breakfast will begin at 9:00 am. The Talking about Books (TAB) and Talking Book groups each consist of members who not only enjoy reading but also enjoy sharing information about books and authors with other book lovers. The group meetings are casual, friendly and informal. Rather than focusing on discussing a book that each member of the group has read, as is usually done in a traditional format book club, our groups are focused on sharing information about titles and authors. There is a wide range of reading preferences within the groups. At any given meeting, titles discussed can range from biographies, history, travelogues, and fiction of all genres. Each group meets one evening a month in a member’s home. New members would be most welcome. The walking group meets twice per week on Monday and Friday mornings, usually starting at 9:30 am and walking about 5 to 7 km. Route directions are found under Walking Routes section of the website or arrange for a copy from one of the Walking Group coordinators. Coordinators: Kathleen Arthorne, Bert Harding, Ann Carney. We have several Wine Tasting groups in QBANA that operate independently. We meet once per month in a member’s home (thus indirectly limiting the maximum size of each group) for a relaxed social evening of wine tasting and chat. The host selects the wine for the evening and will do a little research about the wines, their growing areas and some “experts” tasting notes so that each evening is also a learning experience. There is a fee per person which covers the cost of the wine and some small food items.